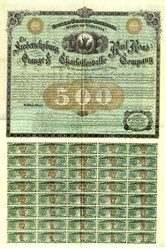 Beautiful uncancelled $500 Gold Bond certificate from the Fredericksburg, Orange, and Charlottesville Rail Road Company issued in 1872. This historic document was printed by the Moss & Co., Philadelphia and has an ornate border around it with a vignette of the Virginia state seal and a surveyor. This item has the hand signatures of the Company's officers. The railroad of The Potomac, Fredericksburg and Piedmont Railroad Company, hereinafter called the carrier, is a single-track narrow-gauge steam railroad, located entirely within the State of Virginia, and extending from Fredericksburg to Orange, a distance of 38.062 miles. Yard tracks and sidings aggregate 2.498 miles and all tracks owned and used, 40.66 miles. The carrier was incorporated by act of the General Assembly of Virginia, March 1, 1863, as the Fredericksburg and Gordonsville Railroad Company. The name was changed to the present name, by act of the general assembly, on March, 1876. The principal office of the carrier is in Fredericksburg, Va. The estate of L. Harry Richards, deceased, holds a majority of the capital stock. The original incorporation conferred authority to build the road, as it now exists, from Fredericksburg to Orange. About 18 miles, from Fredericksburg to Parker, Va., was built prior to 1872. The carrier defaulted in payments under a mortgage securing about $1,000,000 of bonds and the road was sold at foreclosure on December 28, 1872. The purchaser, the Fredericksburg, Orange and Charlottesville Railroad Company, was incorporated by an act of the General Assembly of Virginia, of February 21, 1872, which was supplemented by an act of March 26, 1873, and was recognized as the successor to the rights and property of the carrier. The State of Virginia held some interest in the stock of the carrier, but the extent of such interest is not known. The validity of the sale was apparently in question and the terms under which the Fredericksburg, Orange and Charlottesville Railroad Company was incorporated seem to have been a compromise of the disputed rights acquired at the sale. Authority was given for the completion of the road, but it was provided that, if the extension from Parker to Orange was not finished by July 1, 1873, the property and rights should be forfeited to the State to be held in trust for the former owners, the stockholders of the carrier. The road to Orange was not completed by the date set and the property and rights were forfeited to the State, which in November, 1873, restored them to the carrier. The road was completed as planned, Fredericksburg to Orange, about 38 miles, and as extended was opened for operation May 14, 1878. In 1876, the Fredericksburg and Gordonsville Railroad was renamed as the Potomac, Fredericksburg, and Piedmont Railroad. The new PF&P railroad was soon thereafter sold to the Royal Land Company of Virginia, which had in the same year purchased over 150,000 acres of coal, iron, and timber tracts in Virginia and West Virginia. The company planned to use the PF&P, which would be extended westward from Orange by the Shenandoah Valley and Ohio Railroad, to transport these resources eastward. The Shenandoah Valley and Ohio Railroad was planned to construct a rail line from Orange, the western terminus of the PF&P, across Swift Run Gap into the Shenandoah Valley. The total cost of the 93 mile long Shenandoah Valley and Ohio Railroad was projected to be $970,500, including depots and sidings. The PF&P's track was 3 ft (914 mm) narrow gauge and was extended to Orange by early 1877, a distance of 38 miles from Fredericksburg, the eastern terminus of the line. The use of 3 ft (914 mm) narrow gauge instead of standard gauge allowed for a savings of 40%, and because of this, the company switched the original plans for the Shenandoah Valley and Ohio Railroad from standard gauge to the more cost effective 3 ft (914 mm) narrow gauge. Although the Royal Land Company had planned to extend the line from Mathias' Point (27 miles east of Fredericksburg on the Potomac River) to somewhere near Harrisonburg, Virginia, it failed to build beyond Orange to the west and Fredericksburg to the east.The cost of the 38 mile section that was actually constructed was $956,425.83, and since the Shenandoah Valley and Ohio Railroad never came to fruition, its projected costs were not realized. The previous owners of the railroad regained control in 1878, and continued operations hauling mainly timber eastward. The railroad operated until 1925, when it was sold to the Orange and Fredericksburg Railroad Company after facing financial difficulties. In 1926, the line was standard gauged and was renamed as the Virginia Central Railway (not to be confused with the Virginia Central Railroad) in November of the same year. The entire line except for a 1 mile section in Fredericksburg was abandoned in 1937. The small section of the line remaining still operated under the Virginia Central Railway name until the early 1980s.